May 2014 ~ Eat. Run. Rehabilitate. How Healthy is Your Big Toe? Proper motion, strength, and position of your toes is a concept that is often lost with conventional approaches to health care. The toes may be one of the most commonly disfigured series of joints in the body, especially the big toe. Dr. Perry Nickelston of Stop Chasing Pain refers the big toe as one of the key movement linchpins in the body. For those of you that are unaware of linchpins it is the key piece of a complex system which is vital for holding it all together. In reality, the above pictured toes should not be as common as they are. Right away the thoughts stray to women who indulge themselves with high heeled or skinny footwear with narrow and tapered toe boxes for fashion. During medieval times the fashion was for men to wear long, narrow and pointy shoes (think like elves?) and cadaveric studies of people from this time show that these disfigurements were more common in men than women which is the exact opposite of modern times/studies. These sandals are a little too small for this fellow. A foot or more specifically your toes should ideally look a lot more similar to the above foot. In fact, there really should be a slight gap between your 1st and 2nd toes! Having a big toe that is straight and mobile is beneficial for many different activities. In fact, I would argue that it is probably important for all activities that involve bearing weight through the feet. I've also seen videos of indigenous cultures using their toes with great dexterity. Your big toe is essential for proper balance, running, walking and many athletic activities or exercises. Somewhere around 55-60% of your support should come from your big toe during running. It also helps with foot stability, and explosive propulsion during power movements such as squats or the deadlift. Many bodyweight exercises or yoga positions require a mobile and correctly positioned big toe as well. You should have three major points of contact to the ground through your feet for proper function: the big toe, the calcaneus, and the lateral aspect of the foot around the base of the 5th metatarsal. I dare you to try barefoot pushups without adequate toe mobility. Ouch. I'm sure there are many people out there that are looking down at their feet and are taking notice of a slight to severe hallux valgus angle, or currently suffer from conditions such as hallux rigidus or limitus. You may even be functioning quite well in your prospective sports or activities of daily living. However, I can guarantee that a few things are probably true for you. 1) You are compensating for your poor positioning and/or mobility. 2) Your performance is lacking and could only be improved with improvements made here. 3) Finally, there is a chance you may be part of the 15%ish of the population that presents with Morton's foot. If this is the case your 2nd toe will be longer than your first toe. In this circumstance your second toe is now taking an excessive load compared to what it was designed for. This is genetics at play and is arguably a less evolved toe structure from when the big toe was opposable like a thumb similar that of other primates. In conclusion, the big toe can have a big impact on your health, performance and movement all the way up and down the kinetic chain. Even if you are not an athlete proper big toe health will be paramount when you reach an older age. The elderly are at risk for falling which has very serious impacts on life quality and expectancy post falling. 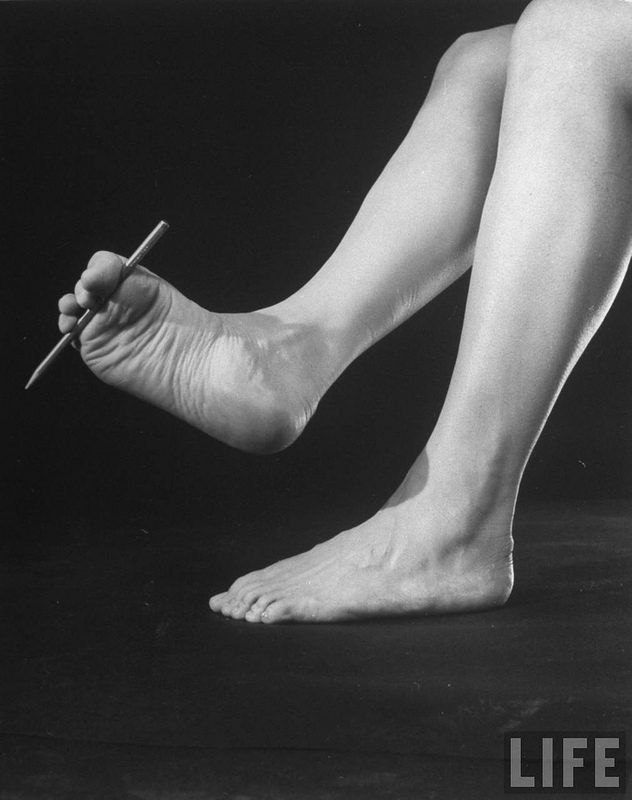 Proper position of the big toe increases stability by widening the base of support and proper mobility of the big toe gives greater proprioceptive input for better neuromuscular control. Both are critical concepts for everybody. Howdy Folks! Today I wanted to take a quick moment to comment on some discrepancies that I have noticed when hearing people discuss thoracic mobility and the need for thoracic extension. Anyone that is familiar with the Functional Movement System is probably well aware of the lack of thoracic mobility that many people seem to suffer from. 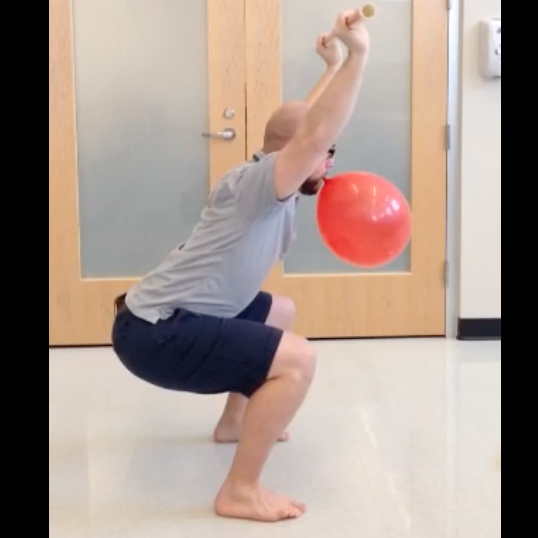 This is something that you often see targeted by FMS corrective exercises or may be a common finding during an Selective Functional Movement Assessment (SFMA) for some. On the other hand, there is the kind folks associated with the Postural Restoration Institute (PRI) that are trying to promote thoracic flexion and minimize hyperextension of the thoracic spine. Then I have heard stories from colleagues at PRI courses mention how they are lacking thoracic extension only to be told they have too much. So what is the answer? 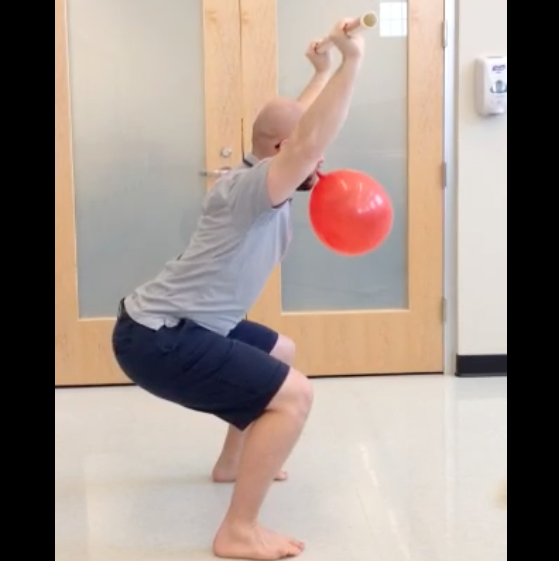 Do we need thoracic extension? Who is right here? Well I believe that both of these systems or schools of thought are trying to achieve the same thing, and are essentially saying the same thing despite it sounding different. I am arguing that people are not differentiating between the different hinge points of the spine and the exact levels of the thoracic spine that they are referencing. Look at this first squat picture below. 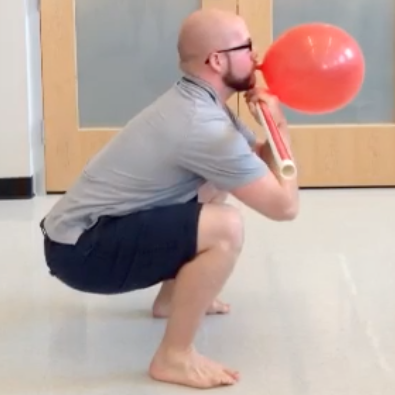 Nobody from either school is going to like this squat form and PRI'ists will notice the excessive thoracic extension from T8 and down while FMS'ers will notice the lack of thoracic extension from T1-T4. Now what happens if we lessen the burden of the upper thoracic spine and by switching this experiment over to a front squat? I am still hyper-lordotic in the lumbar spine and still extend the very last few segments of the thoracic spine. 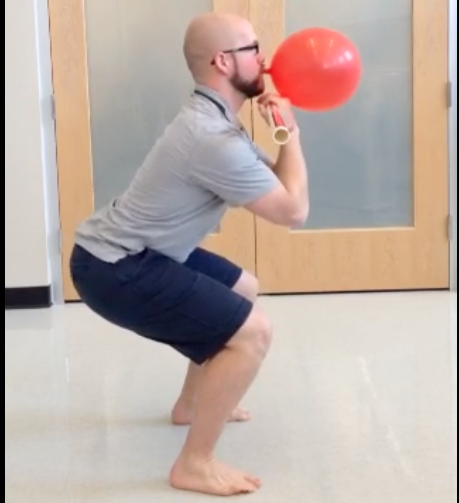 If I perform another big exhale into the balloon I am able to decrease the lordotic curve, increase thoracic flexion from T8-T12 and my femurs actually break parallel! However, if you look closely you will still see a little bit of hyper-kyphosis in the first few segments of the upper thoracic spine. 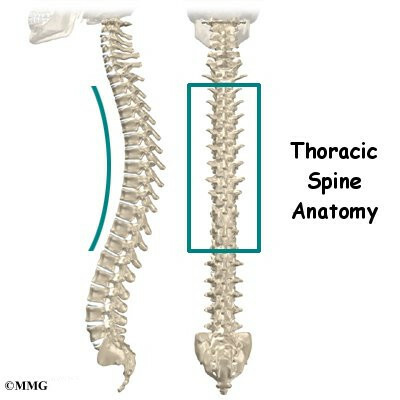 In conclusion, I think there is a lot of confusion by some people when they learn about or speak about the thoracic spine between these two different schools of thought. In reality, I think that both schools are really trying to achieve similar things but sometimes there is definitely a lack of differentiation. I also think that these pictures can also help signify the importance of proper breathing, and the power of the diaphragm, obliques and transversus abdominus over form, function and movement. Just some food for thought! Thoughts?